Canada is home to over 1.5 million people with an Italian background. It should come as no surprise then that Canada and Italy are quite intimately connected. Historically the heart of fashion, food, and innovation, Italy continues to uphold its high standard of professional and personal life. Every year, thousands of Canadians and Italian-Canadians look to Italy for purposes beyond mere tourism. For many of these purposes, Canadian documents are required. These can include but are not limited to corporate power of attorney, birth certificate, marriage certificate, divorce certificate, and RCMP police check. However, since these documents are Canadian and not Italian there need to be a way of validating the authenticity of the document. Italy and over one hundred countries are signatories to the Hague apostille convention and therefore use the apostille process of verifying documents issued in foreign countries. Canada is not a signatory to this convention and instead uses the original process of authentication and legalization. If you have Canadian documents that need to be used in Italy, your documents will need to go through process to be valid for use there. This might seem confusing as you have probably been told to get a Canadian apostille but this is not possible. Authentication and legalization is equal to an apostille and is the required process for any Canadian documents that need to be used outside of the country. Authentication and legalization is a simple process. It involves validating the signatures on Canadian documents. This process occasionally begins with a Canadian lawyer or notary public, who verify or attest that your signature on a document or its copy is real and true. The first step occurs at Global Affairs Canada here in Ottawa. They verify that the signature, stamp, and seal on a document belongs to an individual who is certified to attest that a document is legitimate. If the document meets the requirements of Global Affairs Canada, their agents put their stamp, seal, and signature on the document thus authenticating the document. The second step takes place at the consular section of the embassy of Italy. In fact, there Italian consulates in Ottawa, Montreal, Toronto, and Vancouver. The appropriate consulate where your authenticated Canadian documents need to go depends entirely on their jurisdictional rules. They also have requirements such as additional documentation and fees that need to be provided before they can legalize your documents. These requirements change quite frequently and once they have been met, their consul checks the authentication stamp of Global Affairs Canada and puts his or her stamp, seal and signature on the document, completing the legalization process. This can get quite complicated and even more so when you know that Global Affairs Canada can take over 20 business days to authenticate Canadian documents they receive. This does not include the processing time at the Italian consulate which are subject to change. Waiting over a month for your Canadian documents to be authenticated and legalized for use in Italy is not possible when there are deadlines to meet. Thankfully, there is an easy alternative that thousands of Canadians choose every year: ALSC. As our name suggests, we provide authentication and legalization. In fact, we are the first business in our industry and served our first client over 25 years ago. Since then we have helped tens of thousands of Canadians with their documents for use in Italy and over one hundred other countries around the world. We have worked with all Canadian documents such as RCMP police check, power of attorney, divorce certificate, birth certificate and marriage certificate for use in Italy. For over two decades we have worked closely with agents at Global Affairs and staff at the various Italian consulates across Canada. The professional relationship we have developed has allowed us to be one of the first to know when changes are made to requirements and fees at both stages. This enables us to provide an unparalleled quality of service to all our clients. Additionally, our priority same business day, standard 3 business day, and economy 10 business day services save you anywhere from 10-20 business days of processing time at a competitive price which hasn’t changed in 9 years. When you choose ALSC, our experts will assist you with preparing your documents for authentication and legalization. Once we have received your documents, we take care of the rest while you receive detailed updates as to the status of your documents. Our agents are available at all times during our office hours to address any questions or concerns that may arise. 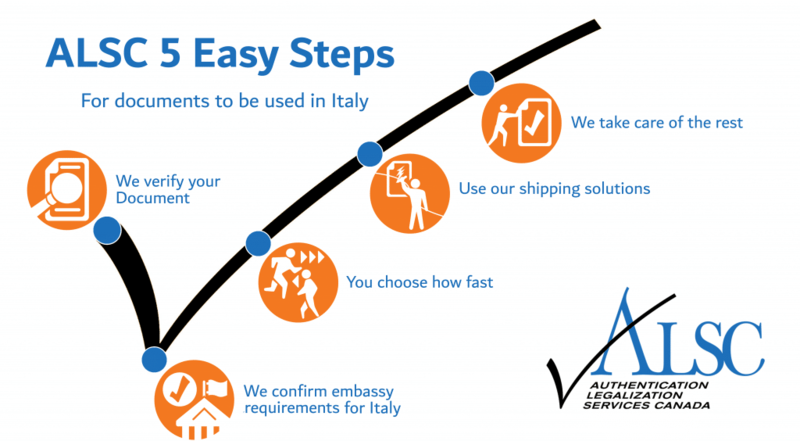 Once your Canadian documents have been authenticated and legalized for use in Italy, we can ship them anywhere in the world you need them to go with one of our shipping partners. If you have Canadian documents for use in Italy, do not hesitate to contact us. We will make sure your Canadian documents are ready for use in Italy with minimal delays at an affordable cost. Continue reading for additional information about some Canadian documents you may need to use in Italy. Canadian vital statistics documents include birth certificates, marriage certificates, and death certificates. These are some of the most commonly required documents for use overseas, primarily for personal reasons such as immigration, right of blood for citizenship, marriage in Italy, or to address matters related to inheritance. These documents are issued by the vital statistics department of the province in which the birth, marriage, or death occurred. Canadian vital statistics documents contain signatures that are on file at Global Affairs Canada which conveniently makes them valid for authentication in the format they are issued. It is important to note that Global Affairs Canada cannot authenticate wallet sized birth certificates. Furthermore, if you are processing a Canadian birth certificate for purposes of citizenship in Italy, make sure you get the longest form possible. These are sometimes known as a copy of an act of birth, or registration of live birth depending on the issuing province. You will have to contact the appropriate Italian consulate to find out exactly which documents you will need for this process at which point we can assist you further. Notarized copies of vital statistics documents can be made but are not recommended as originals are always preferred for authentication and legalization. Originals are also less expensive to have reissued than making notarized copies. If you require a divorce certificate, you will have to get it from the courthouse which finalized the divorce. If you already have your divorce certificate for use in Italy, make sure to check that the stamp, seal, and signature of the court official are all legible and match. If you do not see the name of the signatory, make sure to contact the issuing court and find out who signed your divorce certificate. Global Affairs Canada will need this information to authenticate your divorce certificate. If you have a Canadian power of attorney for use in Italy, it will need to be notarized by a Canadian lawyer or notary public to be valid for authentication at Global Affairs Canada and subsequent legalization at the appropriate Italian consulate. If you do not currently have your power of attorney you can either draft one yourself or have a lawyer assist you. They can also give you legal guidance as to what should be included or omitted. Since birth certificates, marriage certificates, and death certificates are not used very frequently in Canada it is common for them to become lost or damaged over time. Thankfully, it is very easy to order a new birth certificate, marriage certificate, or death certificate from the appropriate provincial body. If you need to do so we strongly recommend you do what many of our clients choose to: send the documents directly to our office to start the process right away. Make sure you contact our office and confirm use of our services before doing so! Below you can find some helpful links to get your Canadian vital statistics documents. Remember to order the appropriate form of birth certificate depending on your purposes. Canadian police checks are another document commonly requested for use in Italy. Police checks are often requested for purposes relating to employment or immigration. There are hundreds of local police checks which are available in Canada. To be valid for authentication at Global Affairs Canada, locally issued police checks will first need to be notarized by a Canadian lawyer or notary public. This is namely because Global Affairs Canada does not have the names of the signatories of all of the local police departments in Canada. Since locally issued police checks are usually based only on name and date of birth, they are occasionally subject to error or confusion with others who may have the same name and date of birth. This is why locally issued police checks are not always accepted by requesting parties overseas even if they have been properly authenticated and legalized for use in that country. As such, many Canadians prefer to get an RCMP police check instead. The RCMP is a law enforcement authority similar to Interpol in the European Union and are likewise recognized on an international scale. Police checks issued by the RCMP are also based on fingerprints, providing a more accurate representation of an individual’s criminal record. Furthermore, RCMP police checks contain signatures recognized by Global Affairs Canada which makes them valid for authentication the moment they are issued. If you would like to get your RCMP police check for use in Italy, you can do so by clicking here. The headquarters of the RCMP is in Ottawa and is located minutes away from our office. As such, many of our clients choose to have their RCMP police checks sent directly to our office to save themselves time. If you would like to do the same, please let us know when you contact us. Authentication and legalization can be overwhelming, even if you’ve done it before. When you have deadlines waiting to be met in Italy this can add to the stress. In a process that can drag on forever, we are the shortcut. We are familiar with the often overlooked details involved and have worked hard to become unmatched in our industry. Our proud membership with the Canadian Chamber of Commerce, A+ rating with the BBB, and growing number of 5-star Facebook and Google reviews are proof that this is true. We are always looking for ways to improve our services which is why we have worked hard over the last few years to become the most accessible business in our field. We have service centers in over a dozen cities across Canada including Halifax, Montreal, Calgary, Edmonton, Regina, Winnipeg, Toronto, North York, Victoria, Vancouver, Surrey, or Mississauga. These allow our clients to save time waiting in line at the post office and save money on shipping costs. Once you have made an appointment through our headquarters and prepared your documents with the guidance of one of our experts, you can drop them off at any one of our service centers and receive free FedEx shipping to our ALSC headquarters in Ottawa for authentication and legalization. When your Canadian documents have been made valid for use in Italy we can ship them to any one of our service centers via FedEx for free for pickup or we can ship them anywhere else in the world at an additional cost. Don’t waste time that can be better spent with family, friends, and other business projects. 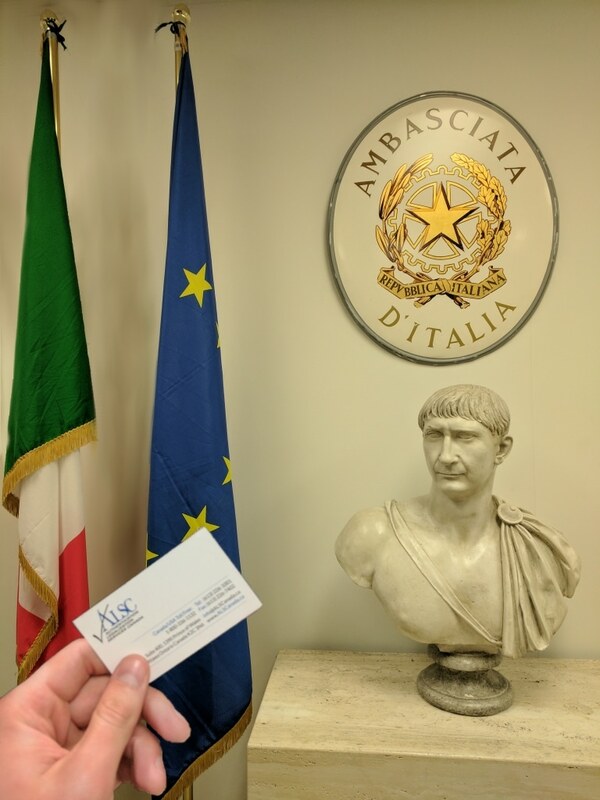 Trust the experts at ALSC and let us take care of your Canadian documents for use in Italy. Click below to get started!